Mr and Mrs Arthur Mustoo of 27 Woodlands Road, Chippenham have received official notification tat their third son, AB Norman Mustoo has been reported missing while on active service. 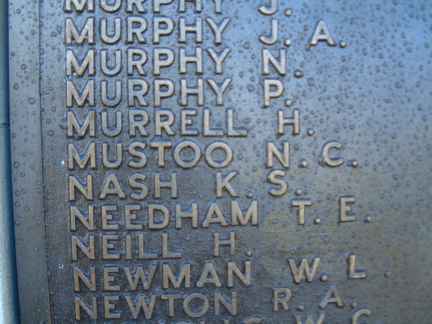 Aged 20 Norman Mustoo was educated at Ivy Lane School and being eager to make a career in the Royal Navy, he was recommended for entry into the Boy’s School by his headmaster, Mr H Greenwood. On leaving school he worked for a time for Messer’s F Holland and Co, the Chippenham tobacconists, and at the age of 15 ½ went to a Naval training establishment at Portsmouth. His 5 years service in the Navy have proved an adventurous time. His first ship was bombed in Spanish waters during the Civil War and he afterwards served in HMS Royal Oak being transferred from that ill fated vessel some months before she was sunk at Scapa Flow. After serving in a Mine Sweeper, he was posted to a sloop, which was mined while on convoy duty. He was recently in the Middle East where he met and spent a weekend with his elder brother, SSgt John Mustoo. His parents received a greetings message form him at Christmas, telling them not to worry about him and on Sunday last, the official telegram came to inform them that he is missing. Of his 3 brothers, 2 are serving in the Army, Sgt Albert the eldest who is now in this country having taken part in the Norwegian Campaign and the Dunkirk evacuation. The youngest brother is still at school. Norman was formerly a member of the 1st Chippenham Scouts. Another man from the Chippenham area was lost on the sinking of this ship (it struck a mine in Alexandria harbour), Stwd Thomas Reginald Wood.